It is interesting how someone you have never met can become a part of your everyday life. Such is the case with Reverend Billy Graham, who has been a household name in my family for as long as I can remember. According to Wikipedia, Billy Graham led 417 crusades between 1947 and 1995 and reached over 210 million people in more than 185 countries on six continents. There are likely millions of people who share the same feelings I have had this week knowing that Dr. Graham no longer makes his home here on Earth. Some of my memories of Billy Graham include my dad keeping an article written by him in his Bible. The article said that in God’s eyes, no race is better or worse than any other because God made all of the nations of one blood (Acts 17:26). There was even an example of God’s wrath toward a family for being racist (Numbers 12:1-15). To me, this is such a simple truth that settles any issue about race. My Mom has said many times over the years that she is glad she lived during a time when the world had a Billy Graham. Even now, part of our Sundays are spent watching the Billy Graham TV Classics. 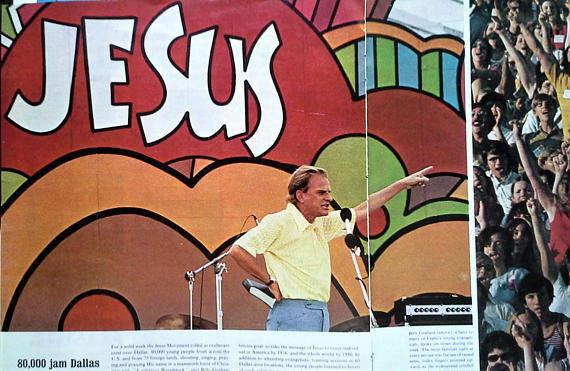 Billy Graham even inadvertently had a hand in my music career. After finishing our very first studio album, the radio station WMIT, which is part of the Billy Graham Evangelist Association, picked up one of the singles. I remember the station manager at the time sending us a message that they rarely added indie artists and how much they loved the song. It ended up making the station’s top 10 songs on the yearly countdown. The encouragement this provided for our music early on was so powerful, mainly because it felt like it had been blessed by someone we considered a giant. That said, the truth is that Billy Graham never considered himself a giant. I heard an interview with someone this week who was asked what it was like to be in the presence of Rev. Graham. The person being interviewed said that Dr. Graham always kept the focus on the other person, or on the subject of God, but never on himself. This reminds me of Phillippians 2:3 that says, “Do nothing out of selfish ambition or vain conceit. Rather, in humility value others above yourselves”. I think this is one reason he touched so many lives. He made it about us, and the impact God’s message of hope could have on our lives.